A quick photo reference to help in identifying Black Soldier Flies Hermetia illucens showing the different life stages (larvae, pupa, adults and eggs). A few other types of Soldier Fly are shown as well in the other posts below. For more pictures have a look at the galleries at the forum and blog. This is the life stage you're mostly likely to encounter first. They may show up unexpectedly in your compost bin/pile or worm bin. The black soldier fly larva is plump, slightly flattened, with a tiny, yellowish to black head. The skin is tough and leathery. Creamy white and about 1.8 mm long when newly hatched, the larva develops through six instars, the last of which is reddish-brown or coffee colored. The mature larva is about 18 mm long and 6 mm wide, although some individuals may be as long as 27 mm. 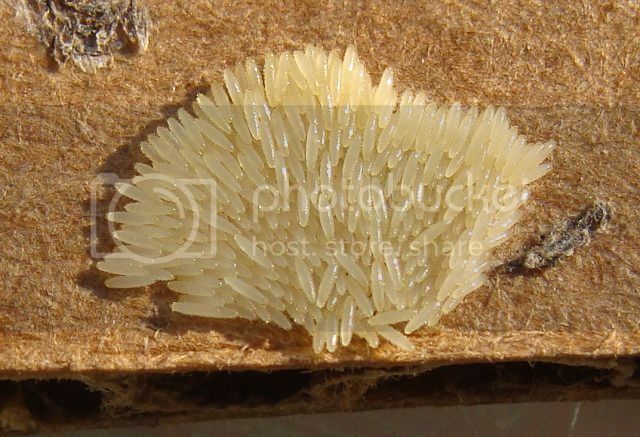 When the larvae are done growing, they enter a stage called "prepupae" wherein they cease to eat, they empty their gut, their mouth parts change to an appendage that aids climbing, and they seek a dry, sheltered area to pupate. The motile (capable of moving) pupa develops within the darkened skin of the last larval instar (puparium). The pupa is about one-third the length of the puparium. You might spot an adult fly or two around your compost but never in swarms. They have a life span of just a few days and only exist to reproduce. The most distinctive features are white bands on their legs and two translucent spots on the second abdominal segment. The diagram above and first two photos below show the translucent 'windows' on the abdomen. They can be hard to see as the fly normally sits with it's wings folded across it's back. The Black Soldier Fly is a wasp mimic which looks like a organ pipe mud dauber wasp to deter it's predators. The windows give it the appearance of having a narrow wasp waist. There are other species of flies with larvae similar in behavior and appearance to the Black Soldier Fly. This and the following posts have details of those we know about at present. Another species with larvae and pupae that look like BSF has been tentatively identified as Ptecticus trivittatus - Yellow Soldier Fly (link). 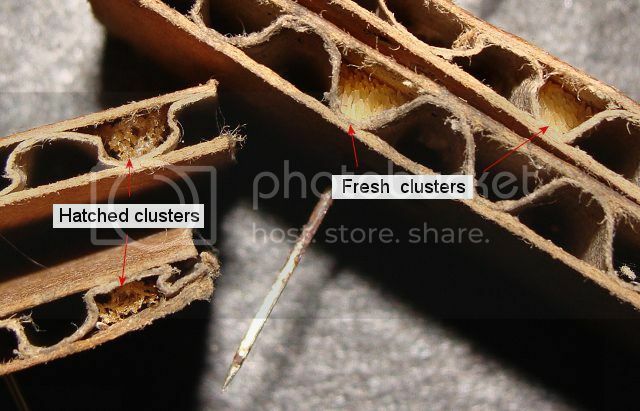 The photos of pupae below (used with permission) are described as "fairly common near my outdoor composting systems during the warmer months of the year" in southern Ontario Canada (link). 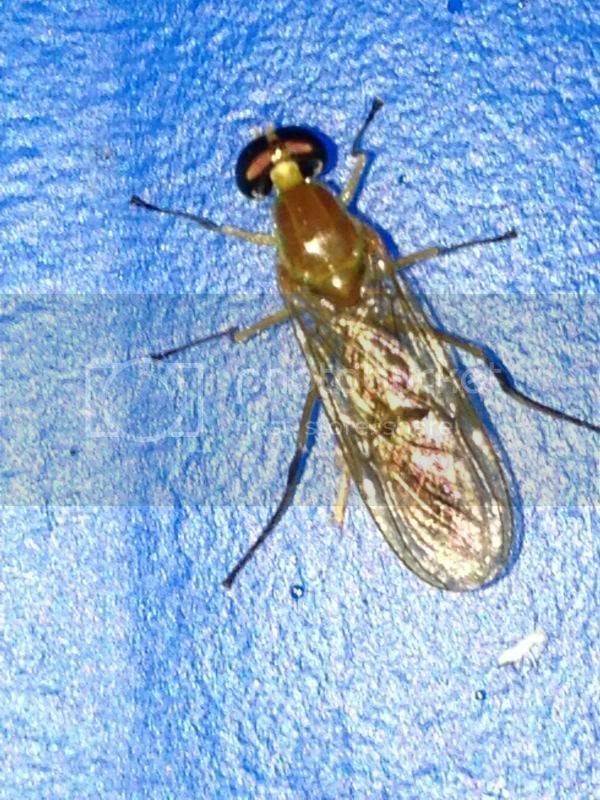 "UPDATE: I e-mailed fly expert, Dr. Stephen Marshal, at the University of Guelph (my former stomping grounds) and received a very quick response, informing me that this is a very common Ptecticus soldier fly species. He suspects that it is Ptecticus trivittatus, but said it would be necessary to key it (i.e. ID it properly using a taxonomic identification key) in order to be sure. " " This is a species that is particularly associated with composts ... She eventually asked whether these flies could be associated with composts. They had brought a worm compost box indoors so the worms would not freeze. It was in a plastic tub with a cover but there were small air holes. She wondered whether the soldier flies could be in the compost. That of course was the source of the problem and why they were seeing such persistent numbers." This photo is tentatively identified as Ptecticus trivittatus - Yellow Soldier Fly is from Hiccup (link) who saw them in NC. Cephalochrysa rufibasis (Walker) "bronze" soldier fly occurs in South Africa . Their mature larvae have zig-zag stripes. See this forum thread (link) for more information and pictures. The larvae of the Garden Soldier Fly (Exaireta spinigera) look much the same as BSF larvae and are also excellent detritivores which can be found in compost piles. The adults are different (have larger rear legs) from BSF so photos of the adults are preferred for a positive identification. The species is native to Australia and has been introduced to New Zealand, Hawaii, California and Canada. It arrived in Hawaii in the 1890s, in California about 1985 and in Canada (British Columbia) around 2002 (link).